Organize a 5-Kilometer Fun Run Fundraiser by selling sponsorships to local businesses. Their contributions can cover event costs including trophies and T-shirts printed with sponsor logos. All runners pay an entry fee and are given a discount for pre-registration. To make it more interesting, tie the event to an upcoming holiday or season. 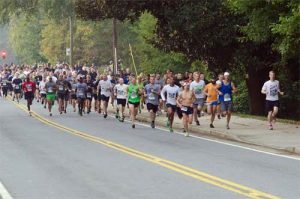 For example, you could hold this fundraiser in October and highlight the occasion with a Halloween dress competition and a 1-mile Fun Run for kids. Or, you can wait till Christmas and make it a Jingle Bell Run. You can still hold the costume contest, and give awards to the top fundraising individual, team, youth and family. An additional fundraising idea is to hold an all-you-can-eat pancake and sausage breakfast before the run. After the run, hold a parade, followed by more food and festivities. You can offer a registration package deal that includes the pancake breakfast, T-shirt and a certificate of completion. If you want your run to be an annual event, throughout the year, give the community updates of the services your organization provides to local residents. Think about getting an honorary chairperson of local or regional fame who can help with promotion. Aim your fundraising run at a target market of individuals. Advertise your fundraiser in several different media, including newspaper articles, radio broadcasts, TV ads, posters, flyers, church bulletins and word-of-mouth. Be sure to mention your sponsors in all publicity statements. Send out follow-up press releases, including photos, immediately following the fundraiser. While you need not give details of the amount of funds raised to the media, do highlight how the funds will benefit the community, so that locals will be willing to support future fundraising ideas.